You might find that the best sofa for your living room is a gray leather sectional, depending on what the colors in your decor are. The leather is also a great choice because it comes in neutral colors and is easy to wipe down when it needs to be cleaned. We’ve put together this buying guide so you can make an informed decision about the best sofa for your home! Let’s check out what we should look for. Material: All of the sofas on this list are either made of leather or faux leather. They are comfortable and often sleekly-designed so that they will fit into a wide variety of different settings and home situations. Special Feature: Every sofa on this list has a special feature, including having a chaise lounge, special headrests, or a reclining section. Some of them even come with throw pillows. 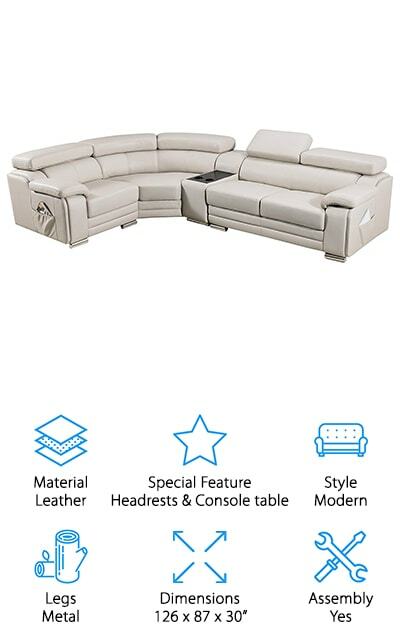 They’re all great features that make these sofas unique! Style: Usually, sofas will come with a particular ‘style’ in mind. In this case, it might look modern or contemporary, or maybe even traditional! All this means is that it is styled to fit into a certain range of decor options. Legs: The legs on the sofas can either be made of metal, usually plated in chrome for the aesthetic, or wood. Wooden legs can be in a variety of styles that help compliment the way the couch looks. Dimensions: The size of the sofa can tell you where it will best fit, and help you figure out where you’re going to put it once it arrives. It will also confirm how many people can be seated on it. Assembly Required: Sometimes the couch will arrive fully put together, and in other cases, you’ll need to put it together yourself. If that’s not something you’re looking forward to, you should get one that comes assembled already. Now that you know all there is to know about leather sectionals, we can get to the sectional sofa reviews. We have done our research and produced this list of the best sectionals we could find so that you can make an informed decision when you decide which one to purchase. Our top pick and budget pick are the best and brightest on our list, so check them out first! Our choice for one of the best modern leather sectionals is the American Eagle Aventura Sofa. This contemporary gray sofa would be a beautiful addition to your living room. The bonded leather makes it a comfortable place to sit and relax after a long day. The frame is solid wood, sturdy enough to hold up to 370 pounds, useful for sitting up to six people. There is only minimal assembly required. The cushions and chaise are made with high-density foam that’s super comfortable and won’t sag even after years of use. It even comes with a separate oversized ottoman that matches the design and color perfectly. The headrests adjust to bring you the most possible comfort with a stylish finish and high-quality materials. We think that this sofa will look amazing in your home, and we’re sure that you’re going to love it as well! This gray sectional sofa is perfectly sized and proportioned to be a great addition to your home or office, and will last your family a long time. 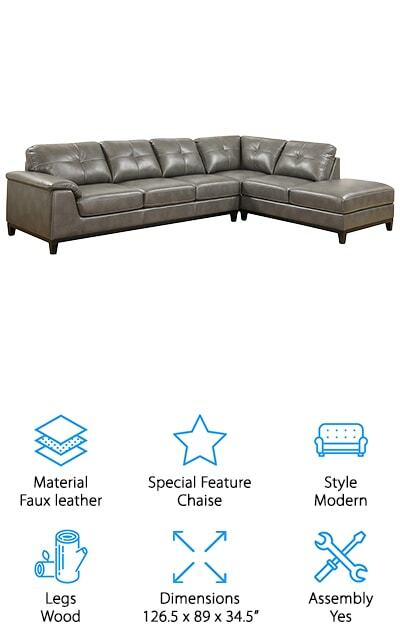 Our pick for the best cheap leather sectional is this Barrington Sofa by Homelegance. It comes with a chaise on the right side that is comfortable and large enough for you to lay out on and doze the day away. The cushions are button tufted, which creates a plush cushion. The cushions themselves are made of padded foam, and they bounce back a lot easier and longer than other cushions might. We love the chrome-finished metal legs as well, as they add a nice contemporary elegance to the sofa. The wooden frame is durable and can support 500 pounds of weight at once, which is important for multiple family members! It’s easy to assemble, so you can have it set up in no time. We love the soft gray color of the leather on this sofa, as it will go nicely with just about any décor. It’s beautiful and easy to clean if you have pets or kids! This sectional sofa by Homelegance is one of the most unique on our list because it’s covered with leather gel, which means that it’s slick and cool with a nice glossy finish that we’re sure you’re going to love. Both of the ends recline, and each of the ends is also equipped with USB ports so you can charge and plug in all of your electronic devices. There’s also a single armless reclining chair in the couch, which is pretty amazing, we think. Three of your family members can recline at once! The mechanism to recline is activated by motion, but the actual work is done by a power system, so the transition is a slow, comfortable glide. It’s also available in dark brown or black if that would better match your living room decor. The Poundex Bobkona is a great small leather sectional sofa with headrests that you can adjust for a great degree of comfort. They adjust into three different positions depending on your height. Unlike some of the other sofas on our list, the cushions include both foam and a spring system, so they’re super durable and comfortable. The pieces of the sectional interlock so they aren’t going to drift away from each other during use no matter what type of floors you have. Both pieces are upholstered with beautiful gray faux leather, and all the tools you need to assemble it is included with your purchase. The back cushions have two separate panels so that the headrests can be adjusted independently for different heights and comfort levels. And if gray isn’t your thing, you can also get this amazing sofa in espresso, light gray, and white as well. There’s a version for every decor and setting! 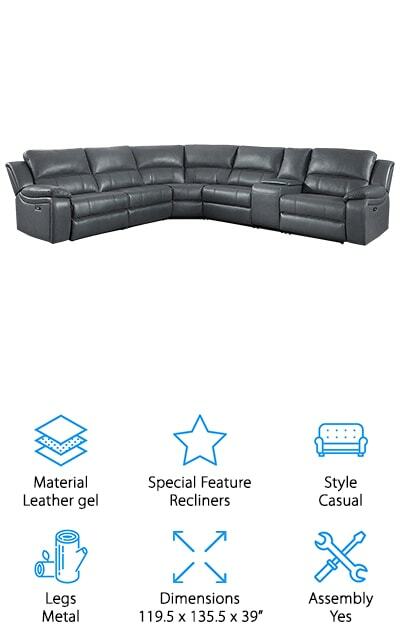 This modern leather sectional by American Eagle is the perfect size to fit in the typical American living room. It looks really nice, a somewhat classical twist on a modern piece of furniture. It includes adjustable headrests as well as a magazine pocket on one end and a console table in the middle. This table has cup holders so that you can safely rest your drinks while you’re taking a load off. The wooden frame is sturdy and will hold all of your family members without complaint! It’s going to last you a long time - the top grain leather is high quality and feels wonderful to touch. It’s a durable couch that will last your family a long time! The cushions are made of high-density foam that’s perfect for lounging on both the two-seat sofas well as the long, relaxing chaise. There is some simple assembly required once it arrives, but it’s fairly simple! 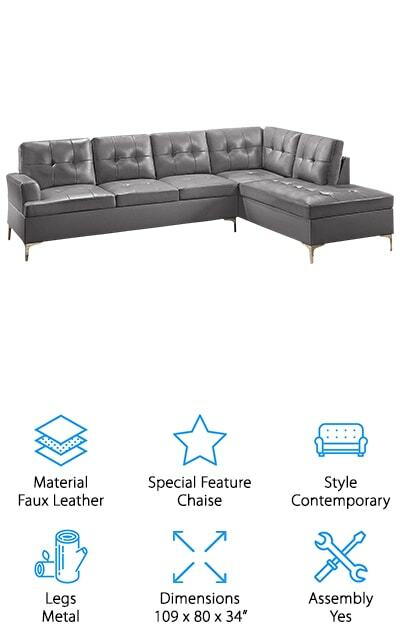 The Marquis faux leather sectional sofa by Emerald Home will fit perfectly into your living space. It has wonderful sofa dimensions, so it’s going to be great in whatever space you choose to put it in. It’s made with your comfort and durability in mind, with spring frames and pocketed coils for extra comfortable cushions. These are going to be exceptionally comfortable for a long time to come. The arms are padded, and it’s all done with contrast stitching so it looks just as good as it feels. We love that this piece can be ordered in several different varieties, including a version that seats six and a version that seats five, as well as a detached sofa and loveseat. The feet are recessed so that they don’t show on the outside of the couch, creating a unique look that doesn’t have to be set against a wall. The texture added by the stitching only makes this sofa more amazing! 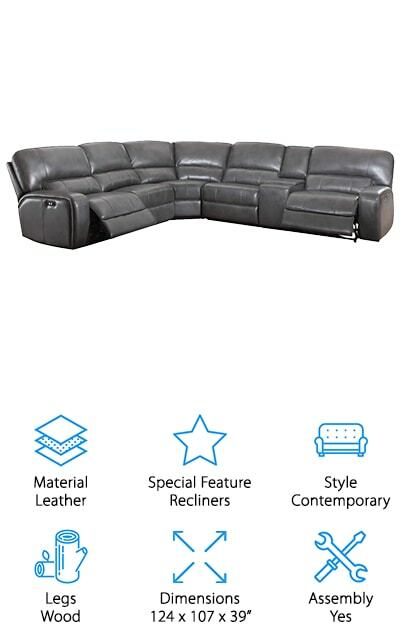 This L-shaped sectional by Divano is a simple leather sofa that will go perfectly in your normal, everyday living room. 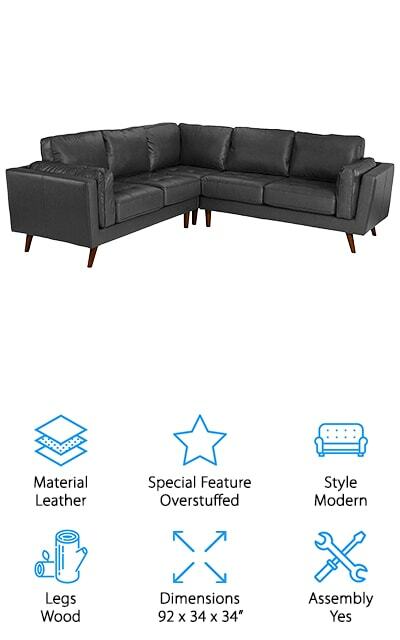 It doesn’t have the same list of special features as some of the other sofas on our list, but it has comfortable tufted seat cushions that are overstuffed specifically for your comfort. The legs are finished with dark wood, so it will fit in any modern-type decor or setting. It’s available in different colors, so if gray doesn’t really match the rest of your living room you have plenty of other options as well. We love the style of this sofa, and we’re sure that you will too – it’s sure to look classic and beautiful in whatever living room you choose to put it in. The overstuffed arms and cushions give this sofa all the extra comfort that you’re going to want or need for your relaxation needs. It’s stylish and functional, and just perfect for your home! This Da Vinci sofa by Iconic Home is elegant and beautiful! It has a chaise on one end for lounging and relaxing in the best possible way, and it even includes three accent pillows so the look is complete. The upholstery is button tufted so it both looks and feels plush enough to be comfortable. 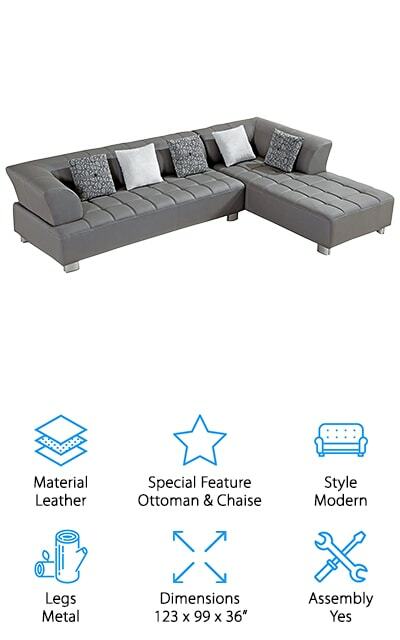 If you’re looking for the perfect gray leather couch for your den or office, this will do nicely. There are so many nice details that make this couch perfect, including double row nail heads, and the legs are a perfectly polished metal. You’re going to love how detail-oriented this sofa is, we know that you will! It’s a beautiful piece with bench seating instead of cushions that separate the seating, so you can be friendlier with your family or guests that sit on it. It’s great for both contemporary design and traditional ones, and you’re definitely going to love it either way! 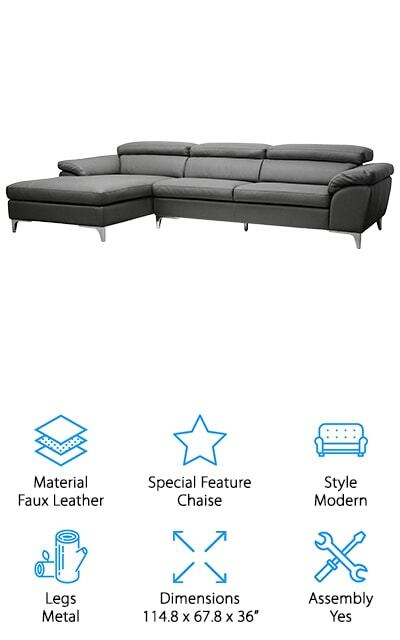 The Acme Saul sofa is elegant looking and includes a lot of features all in one! On either end of the beautifully crafted leather sofa are power recliners, so that you can sit with your feet up in one smooth motion and without having to do any of the work yourself. We love this mechanism! In addition, it also has a console area with a lot of storage for your remotes and other things you need while relaxing on the couch. This includes a USB power dock so that you can charge all of your devices without having to leave your phone across the room. It also, of course, has a cup holder for all of your drinks. We love all the features that come with this ultimate relaxation sofa! The grey leather is comfortable and perfect for a day off from work or a night watching movies with friends. We love it and you will too! 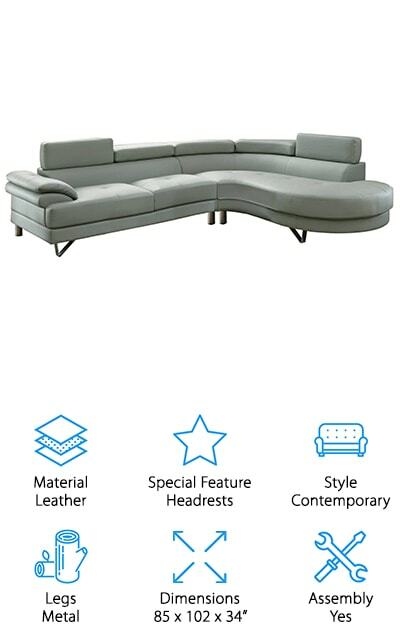 The final sectional on our list is the Baxton Studio Sofa. It’s made of beautiful gray faux leather that is easy to clean by wiping it down with a damp cloth when you need to. The special feature that makes this sofa top our list is the chaise on the left side. The feet are made of chrome-plated metal that will be gentle on your floors. The polyurethane cushions will be comfortable for years to come, and spring back better than regular cushions. They’re great at holding their shape. This sectional comes in two pieces for easy hauling. The dark grey color of the faux leather will fit perfectly in any modern decor. The frame is wood instead of metal, which is a nice touch that adds to the life of your sofa because wood bends less readily than metal. The chaise portion is also large and comfortable, so you can relax in peace.